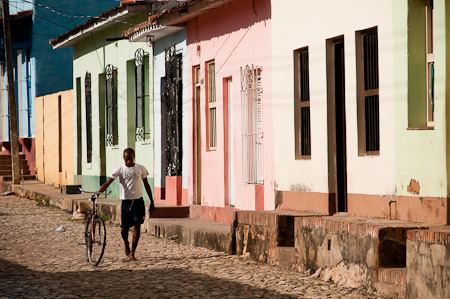 In Cuba, colour combos abound. What an incredible country. 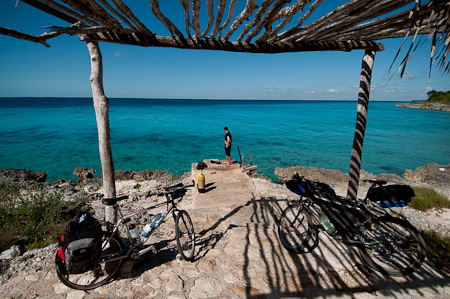 What an amazing cycling destination. It’s hard to know even where to begin. There’s much to report from just two weeks of travel. 21st century communist Cuba is a complex place, and a large part of independent travelling here has been simply experiencing and contemplating its socialist system: both the inspiring policies introduced with the Castro-led revolution of 1959 (like nationwide education and universal healthcare), as well as some of its obvious downfalls (lack of money/freedom of speech/travel). It’s not all clear cut though. 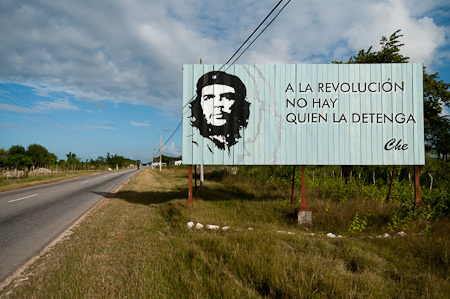 For instance, Cubans contend with massive billboards evangelising the benefits of socialism, quoting nuggets of wisdom from past leaders and revolutionaries. But in return, they live in an almost advertisement-free world, far removed from Western-style consumerism and its own form of control. Away, as Che once said, from the ‘invisible cage of capitalism’. Politics aside, its capital city, La Havana, is like nowhere else I have seen: both supremely elegant and decidedly run down. The people we’ve met on our travels have invariably been warm and hospitable. At night, when the air is filled with music, when bars flow with rum and young men loiter in doorways, its streets still feel noticeably safe. There are casas particulares (Cuban B&Bs) everywhere, serving up platters of lobster, fish, chicken and fresh fruit to fuel you on your way. Except for a couple of challenging mountain belts for those in search of Alp-like climbs, the terrain is relatively flat. Ok, so there can be brutal headwinds to contend with, but if you pick your route carefully, you should get through pretty much unscathed. 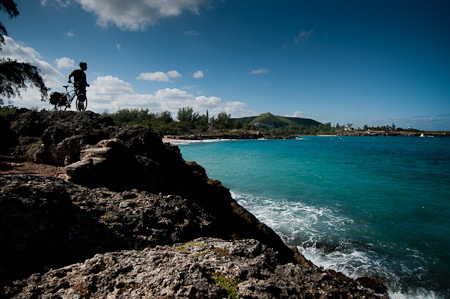 And did I mention those crystal clear Caribbean and Atlantic waters? They’re the perfect way to wash away sweat and temper the midday heat. 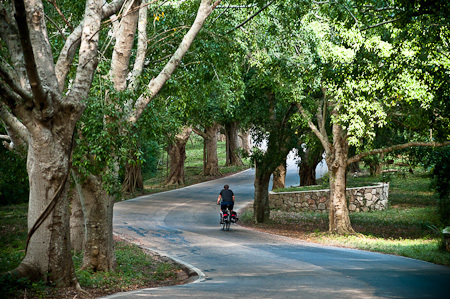 For the cyclist, it helps that its roads are all but empty of cars. 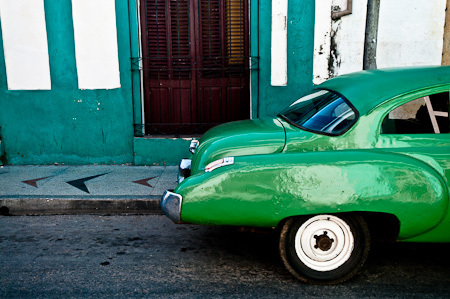 Money-tight Cubans are masters of reinvention and for the most part, people travel in old Russian trucks, or by horse and makeshift cart, or homemade bicycle taxis, recycled from old bike and motorbike parts. 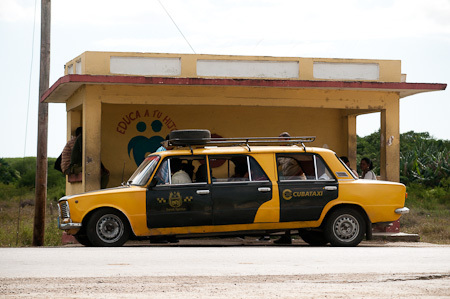 Pre-embargo classic are crammed with passengers, and even the tiny, boxy Ladas have been stretched into surreal limousines. I’m convinced that this lack of traffic empowers communities, reclaiming the roads as a place where people can gather in the evenings and kids can play freely. 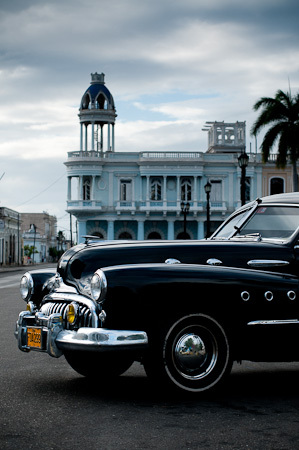 Certainly, Cuba really comes to life in its streets. All in all, the more we travelled in Cuba and the more people we talked to (which isn’t always the easiest thing to do), the more we realised what a complex country this is. And the more we wondered about how it possibly gets by. 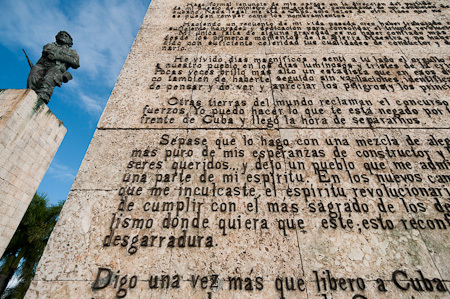 Modern Cuba is undoubtedly founded on noble ideals. Under the strain of a trade embargo and without the Soviet block to bolster its economy, its ongoing resistance to being shaped by the business-lead interests of the US is noble too. Of course, it’s hard to get beneath the veneer of tourism and know what people really think. Yet to those unconvinced by the real-world benefits of capitalism, it’s also hard not to be impressed by at least a part of what socialist Cuba has achieved, and continues to struggle for. Ultimately though, whether or not you buy into Castro’s firm handed government and its results, Cuba is a country that will doubtlessly challenge the way you think. Each and every day, Nick and I spent hours contemplating Cuban socialism, and trying to decipher what we thought of it. Which, in my mind, is good a reason as any to visit this incredible place. We caught a bus from Havana to Cienfuegos, then spent a week touring Central Cuba before riding back to the capital again. This took advantage of the island's westerly winds. Most days we ended up in fantastic accommodation overlooking colonial squares, like this one in Remedios. My brother Nick in the small village of Limonar. This is our fifth bike tour together over the last decade, joining Syria, Northern India, Kyrgyzstan and Tunisia. ... or driving classic American cars imported before the revolution of '59. These old gas guzzlers are everywhere, preserved thanks to the longstanding US trade embargo. To keep the country going, thousands of single speed bicycles were imported from China. Refreshingly, there's no insidious advertising from multinational-owned businesses. But what you will see are massive placards by the roadside quoting Che, Fidel, his brother Raul and other key figures in the Revolution. As well as more subtle messages on many a street corner. Educate your child, reads this one. 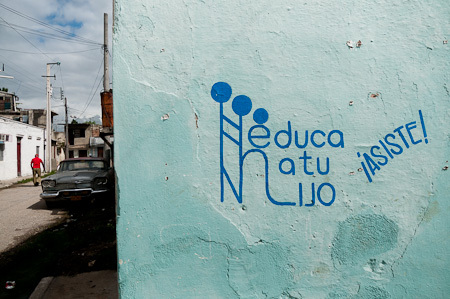 Cuba has one of the best literacy rates in the world, at 97%. The fall of the Soviet Union in the early 90s and the ongoing trade embargo and has placed enormous strain on the country's socialist system. But the message is always the same. Hasta la Victoria Siempre: to victory, always. We couldn't quite figure out what people thought of Fidel. But Che seems to be universal adored. 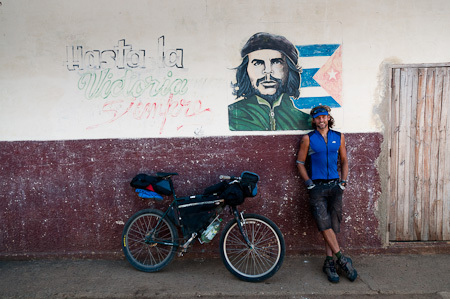 Memories of the Argentine revolutionary Ernesto 'Che' Guevara are everywhere. In Santa Clara, we visited his memorial. Killed in Bolivia in 1967, his ashes weren't returned to Cuba until thirty years later. I listened to a young mother telling her daughter Che's story as they walked around the adjoining museum. 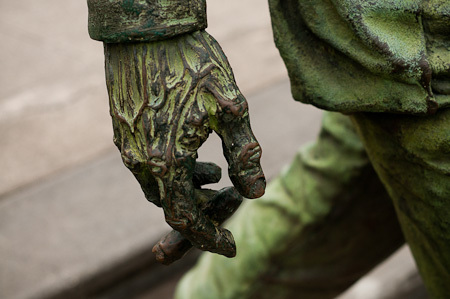 The famous Che cigar, from a life size statue outside the Communist Party headquarters in Santa Clara. Fed up with Tescos? 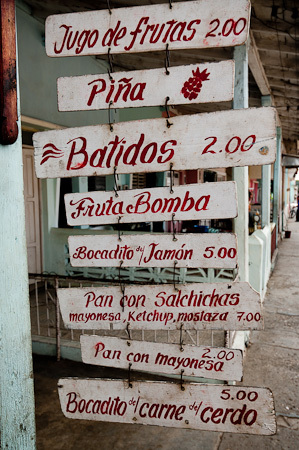 In Cuba there are no supermarkets to speak of, even in and around the larger cities. 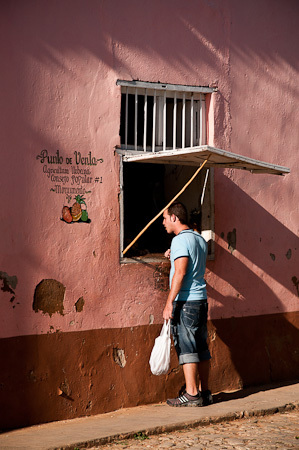 Small markets, or hole-in-the-walls like this one in Trinidad, are where you buy your fruit and vegetables. Which in turn come from places like these. 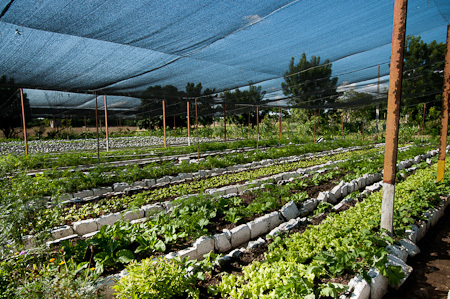 There are hundreds of Organoponico farms scattered across the country, providing locally grown food for each municipality. I stopped to take a photo of one and was invited in to have a look around. Run by four workers, the place was filled with carrots, sweet potatoes, herbs and all kinds of green goodness, flourishing in the November sun. These little succulent little lettuces will soon be moved to a bigger field. 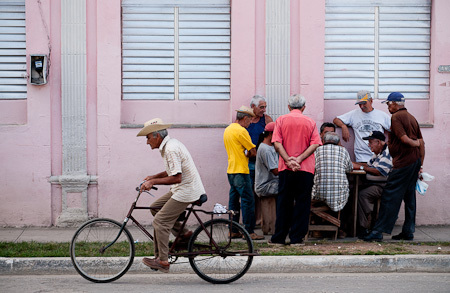 A classic Cuban scene: groups of men huddled round a game of dominos. It's a surprisingly rambunctious game, with each piece slapped down noisily to encouraging shouts and whistles. In a country where people somehow get by on so little, the tourist dollar is ever more important. 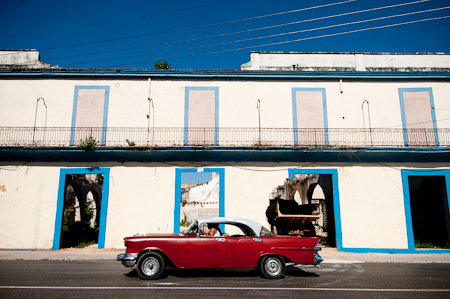 Cuba spends a portion of the money earned to restore its buildings. 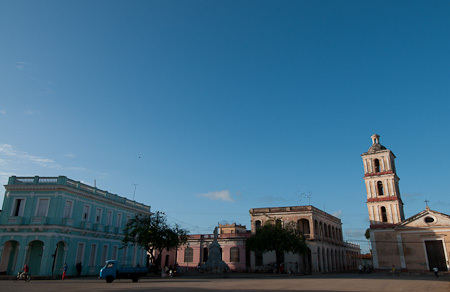 Walking around immaculate central plazas like this one in Cienfuegos feels like stepping into a 50's film set. ... but the majority, like this Chevrolet from '59, are more sad looking affairs. The owner said it would cost him a couple of hundred dollars to get it back up and running, several times the average monthly salary. In any case, most people can't even afford to buy or own cars.Those that do rely on remittances sent in from abroad, or hand me downs from one generation to the next. 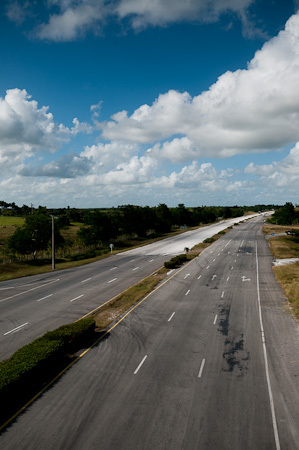 Hence this near empty autopista, a three lane highway built with Soviet money. At this time, Cuba entered what Castro called the 'Special Period in a TIme of Peace.' Cost cutting Innovations included the stretch Lada... Other initiatives included enforced car sharing when hitchhiking. 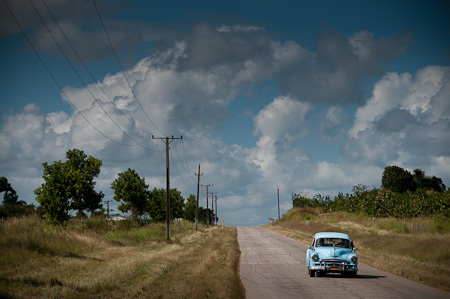 As a tourist though, we experienced a different world to the working Cuban. Casas Particulares may be amongst the cheapest official forms of accommodation for foreigners, but at 20 CUCs per night, they cost the equivalent of the average Cuban's monthly wage. 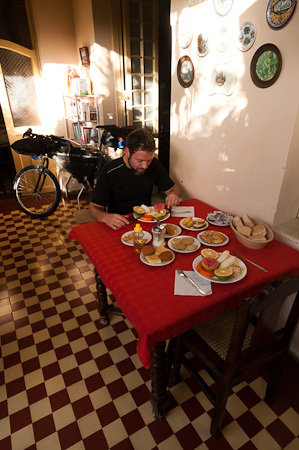 Like their British counterparts, casas promise massive breakfasts. A spread like this will typically set you back 3 CUCs - a little over 3US. In fact, everyone seems to have something going on on the side - time and time again we were told how hard it was to survive on salaries or pensions alone compared to the 'glory days' of the 80s. Like much of Latin America, remittances from families living abroad play a big part of the economy. Casas Particulares are one of the best businesses to be in, though there's a limit of two rooms per household, and high government taxes are levied. 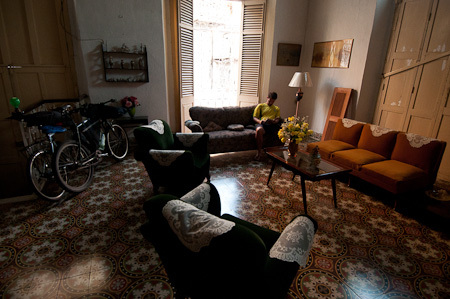 Here, Nick grapples with another Times Crossword in our beautiful casa in Matanzas. Almost all are incredibly well kept. 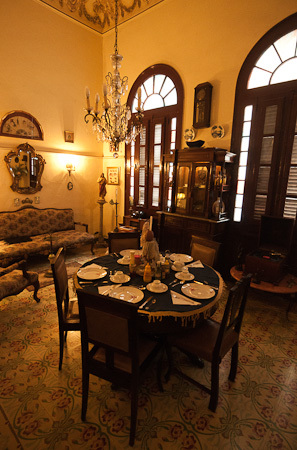 This is where we had breakfast on our first morning in Havana. 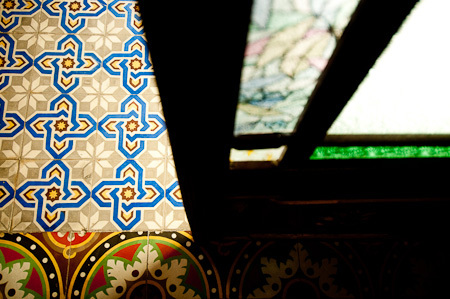 In a country where nothing is squandered or wasted, some felt more like museums than homes. No doubt estate agents would go crazy for those original features. But in Cuba, there's no over inflated housing market - homes are swapped for ones of a similar size rather than bought and sold. Out on the street, it's a different story. Most people can only afford to use the local currency, the Peso National. At twenty four pesos to a single CUC, your tourist money goes a long way. As you can see, even a sandwich won't set you back more than 5 pesos - a fifth of a CUC. That's not much more than 20c. 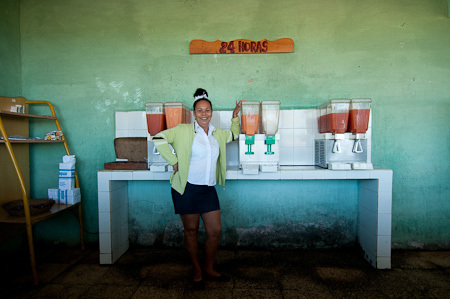 In the countryside, amongst orchards of citrus fruit, this juice bar was a real find. A glass of fresh papaya juice here cost half a peso. About 2 cents. 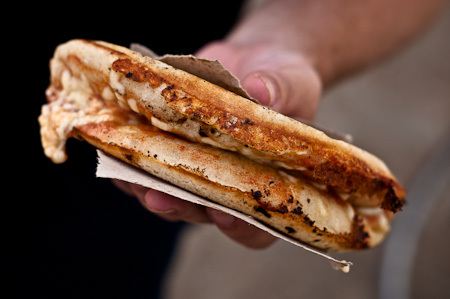 The peso pizza is a Cuban staple: hunk of white bread and fatty cheese that will set you back 20c. To the lucky ones travelling with foreign currency in their pockets, Cuba suddenly becomes embarrassingly cheap. 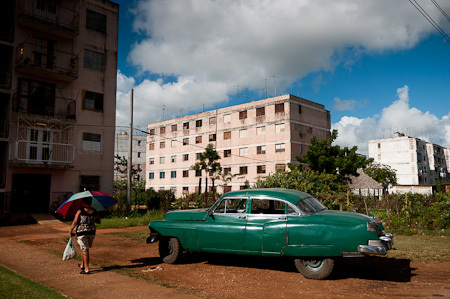 ... while the suburbs, where the majority of Cubans seem to live, are not quite so idyllic. A few swanky resorts aside, at least everyone has access to the beach. 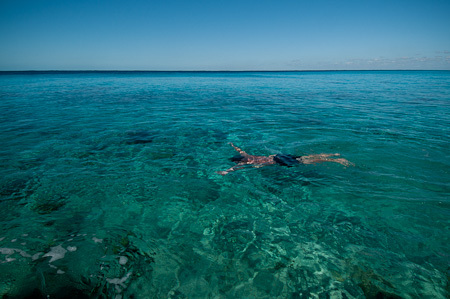 The main tourist draw is Cuba's stunning waters, home as they are to the largest coral reef in the world. While the big, government-run resorts have bagsied the main cays, there's still plenty of public spots to stop and cool off, like Punta Perdiz, on the way to Playa Larga. 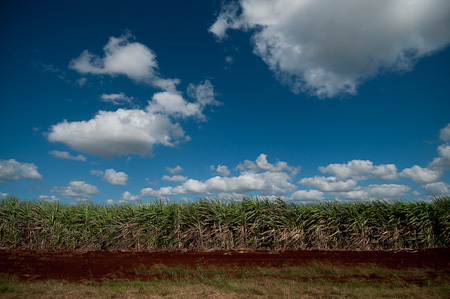 Aside from its growing tourism business, Cuba also relies on its sugar cane and tobacco production, exported to Latin America. Cuban medical knowhow is also exchanged for Venezuelan oil. The travel-restricted Cuban doctors are allowed two years working in Venezuela, before returning home for good. They certainly need the money. A history teacher we spoke to in Matanzas could see nothing positive about the revolution - citing the government's control over freedom of speech and Cuba's fall from economic glory as prime examples. As seen by this shell of a building close to the waterfront. 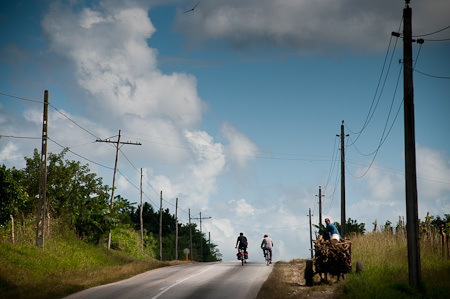 Moving on from Matanzas, the ride back to Havana unearthed this few quiet detour, away from the main Via Blanca that feeds into the capital. ...revealing yet more beguiling turquoise waters. With a few more days in hand, this would have made (yet another) perfect stopover for the night. But our seventeen day journey was coming to an end. So we pushed on, fuelled by fresh sugar cane juice sold by the roadside. 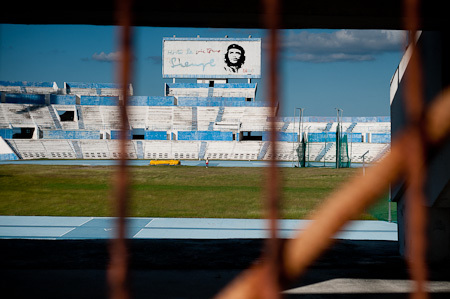 Perhaps a little worse for wear these days, a poster of Che still stands proud and tall. 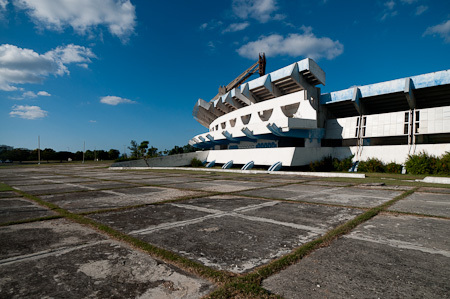 Considering its size, Cuba has been incredibly successful at the Olympic games, and even ranked 5th in the medals table in 1992. Baseball and boxing are particularly big sports here. 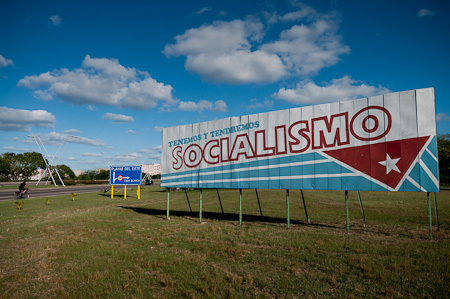 Yet more Socialist propoganda greeted our arrival to the city, including billboards quoting the adverse effects of the trade embargo on the Cuban schooling and health system. 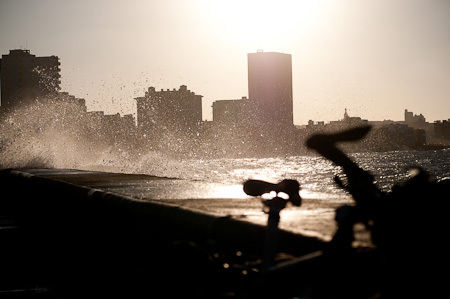 Back in La Habana. 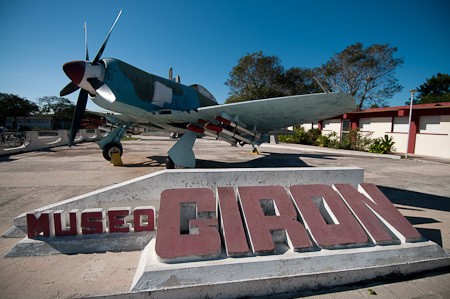 This is the original boat that transported Fidel and his 'army' of 82 fighters from Mexico to Cuba in 1956. 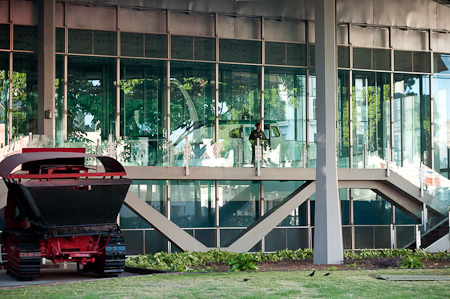 It's protected behind glass and guard 24 hours a day. 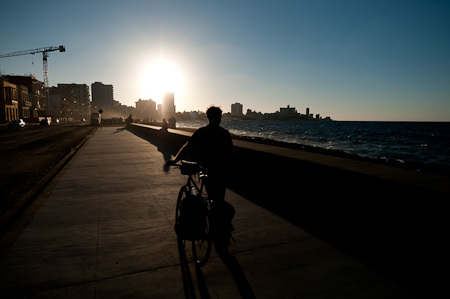 This entry was posted in Cuba on December 11, 2010 by Cass Gilbert. Ahhh… another brilliant description of this amazing country. 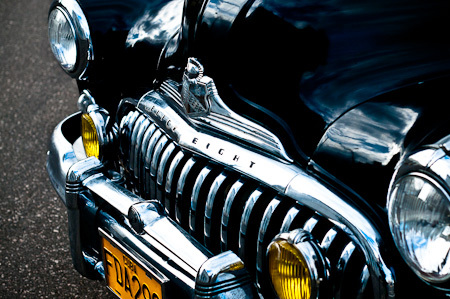 As always I am bowled over by your photographs and writing… LOVE these classic gas guzzlers and that fatty stuffed cheese thing made me drool. Quite fed up with Thai food… waiting for your next in eager anticipation. Beautiful photos & a thoughtful writeup. Where to next? 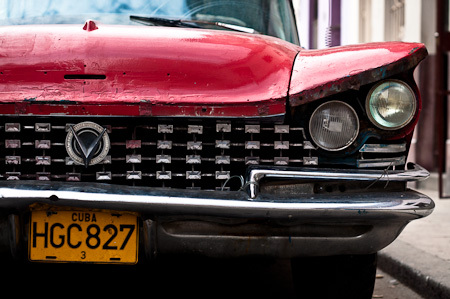 Cuba is full of contradictions…I found it best not to try to figure things out or rationalize. Just accept it for what it is. Wow, Cass! I have wanted to see Cuba for awhile, but now I have several more reasons to go there! As always, the pictures and descriptions are phenomenal. I am very curious to experience a country that has fallen under the influence of former Soviet Russia. Do you have a developed opinion of this communist country? I hope you are continuing to have a wonderful time wherever you are! 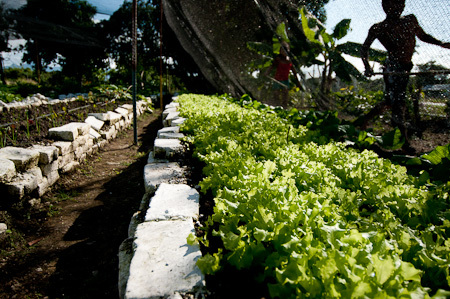 Great to read about your impressions on Cuba – I am particularly interested in their story surrounding the oil embargo and how this, has actually held them in good stead with regard to their return to organic food production systems. Nice to see that you saw some of them en route. Anyone interested in Cubas story should definetly watch ‘The Power of Community – How Cuba survived Peak Oil’ – a brilliant take and lesson to all on our oil addication, an example on options and hope! Cass, just found your web, someone had posted a link of your site on Dpreview.com, so glad he did. Been planning to do a short tour, not too expensive, and you just gave me the answer. I was born in Cuba, came to the USA, at 9 with my mother and two young siblings in 1971. Your great article and photos filled my head with emotions and wonderful memories. Thank you so much. Really enjoy your site. 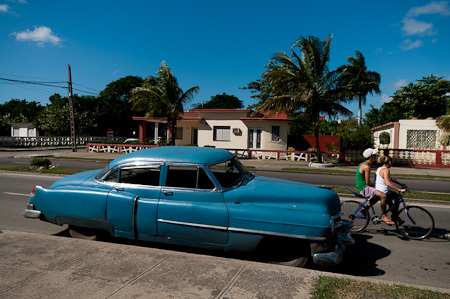 Thanks kindly for the message Tony, and for sharing your slice of Cuban history. I’m really happy to hear the photos and stories rekindled some good memories. CUBA. Dear Cass, I was in correspondence a year or so ago with a young lady and gave many, many hints on Colombia where I and my wife have cycle toured independantly 8 times. I was under the impression she would be going with you but suddenly there was a death in the family and it all went pear-shaped. Tourist CArds- can I get them at Havana airport on arrival there? Otherwise at our airlines check-in desk in London? I ask because I will have to book flights for us at the last minute when her leg is sufficiently strong and there may not be time to apply at the London consulate..
Cashpoints? For 6 weeks we estimate approx £2500 ( casas particulares /small hotels) and I do not fancy taking such a large amount around in Cuba. Are there cashpoints enough and are they reliable? I have read plenty about Cuba, routes, traffic ,roads, accomm etc.etc. but the above 2 queries remain outstanding. If you like I can send you my travellogs for Colombia and this year Ghana and Georgia .Other reports for Japan, Guatamala Caucasus are on the http://www.rsf.org.uk web-site. Not sure who this young lady was that you reference (?! 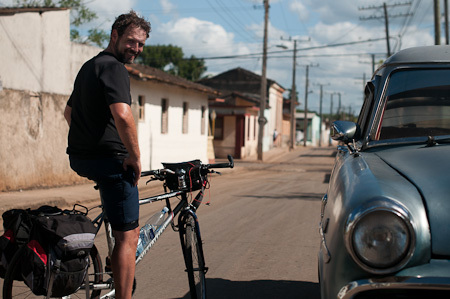 ), as I’ve only ever been to Cuba with my brother… But I’ll let you know my thoughts. Bear in mind this was four years ago, so the info could well be out of date. Have you tried the Lonely Planet Thorntree for more up to date info? As for money, we took out a mixture of pounds sterling as backup (don’t bring dollars, as I’m sure you know) and from what I remember (but don’t quote me on this), we used the ATMs without any issues. I don’t know if there are restrictions on the amount that can be pulled. They seemed to be in most major towns. All the best, and I hope your wife’s poorly leg heals up ok.
see myself in a fixed place and riding from there. Need to know of cheap and quiet accomadation. very important how I would get there from the airport and back. Must be centrally positioned so I can get there. Would like to book all from here so everything is organised do not want to be stuck not knowing what to do once I arrive in Cuba. Perhaps best to try a resource like the Lonely Planet Thorntree for up to date info? I can only offer the advice in these posts – eg accommodation that I stayed at.